Puthucode is a picturesque village situated in idyllic surroundings in the central part of Kerala. It is located almost on the westernmost boundary of Alatur taluk in Palghat district, and is a border village lying between Palghat and Trichur districts.. 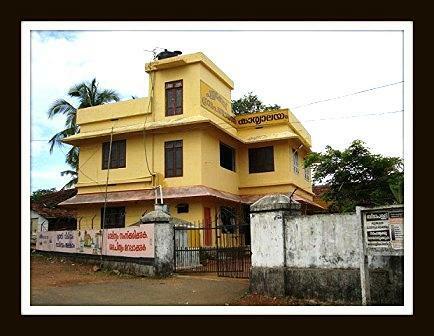 It has an old Bhagavathy Temple some 400 years old called Sree Annapoorneswari Temple, which is in the centre of four streets: South, East, North, and West. Each street is referred to as a village. At the end of North Village, there is a Shiva temple and a water tank(Ayyankulam). Next to the Shiva temple, a mandapam called Shiva Mahal has been built. Despite a historically large Brahmin population in Puthucode, It has a newly built mosque in the centre of surrounding lined houses ((Theruvu)), essentially where ((Mappilla’s)) stay in all different directions. The celebrations during the traditional Nercha season are popular, and Puthucode is also well known for its Navaratri celebrations . Puthucode Kovil Pulimkari or Pulungari, a variant of sambar, is typically made at temples during the Navaratri festival. It uses a combination of four vegetables: white pumpkin (elavan/safed bhopla), yellow pumpkin (maththan/laal bhopla), raw bananas (vazhakkya/kachcha kela), and elephant foot yam (chenai/suran). In puthucode the next famous land mark is Sarvajan High School.its build 100years before & near in front of West Nada of Sri Annapoorneswari Temple. The main feature of this school is front side and back side of the school two Famous temples situating.one good and big play ground is there in the school. Among Puthucode's well known residents are the late Shri Puthucode Krishnamurthy, a Carnatic musician, Mr. M.H. Krishna Iyer- of Manapadam Gramam(Ex Deputy collector) ,Mr. P. Rajagopal I.A.S of Kanakkannur(Ex collector Palakkad) and Justice Mr. P R Sundaram Iyer of South Village. Mr. P C Sriram, a well-known cameraman in Indian Cinema, is the grandson of Justice P R Sundaram Iyer. Mr.O.Rajagopal Ex-Union Minister Railway is from Kanakkannur, Puthucode.